Bread Bread and more Bread! My wife is quite the baker. She makes homemade whole wheat bread that is absolutely awesome. It doesn’t taste like nuts and twigs, it is soft, airy, and very tasty. We not only like the flavor, we enjoy the benefits of using whole wheat. We grind our fresh wheat berries and make whole-wheat flour just before making the dough. This day she made bread, dinner rolls, and hamburger buns. Laura has a blog and wrote about it too. HARVEST LANE COTTAGE . Laura makes all kinds of craft items, soap, jam and jelly, baked goods, and whatever else she comes up with. I want to start painting again so I have a project that I will be starting here soon that we will be offering at some Fall craft shows. The first will be Farm Girl Fest coming up in Sept/Oct of 2010. If you have not tried fresh whole-wheat bread, you should. You can click the link about on HARVEST LANE COTTAGE for more information. 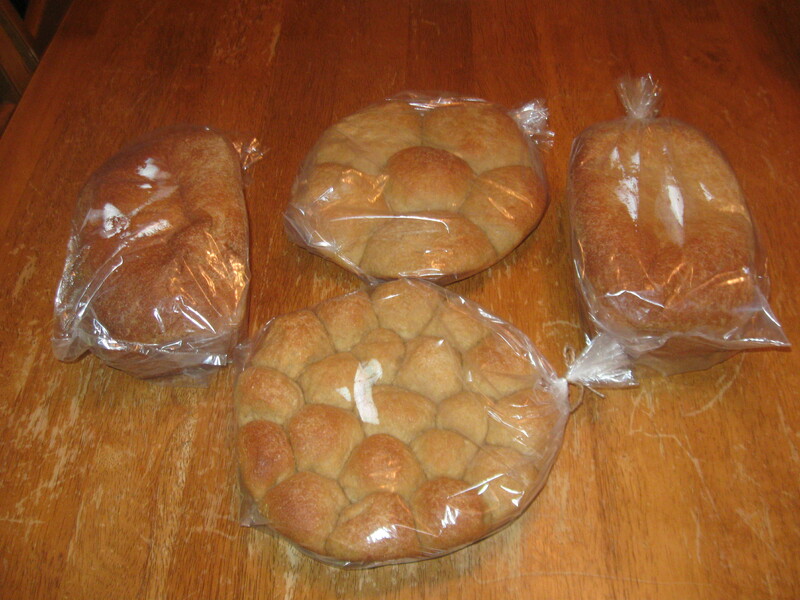 If you would like to order some bread you can e-mail us at lane.family@yahoo.com or call 417-358-0963. This entry was posted in Cooking Tips, Farm Girl Fest and tagged 100% whole wheat bread, bread, Farm Girl Fest, Harvest Lane Cottage, health, healthy, healthy recipes, whole wheat. Bookmark the permalink. 3 Responses to Bread Bread and more Bread! the wheat bread is awesome, i would like a loaf a month. can you make whole wheat pancake mix ?? I will find out and let you know. Good question.